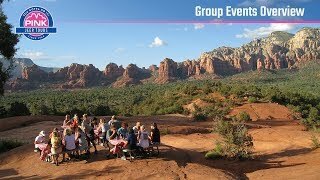 Get your attendees or clients out of their element with group adventures in Sedona, the Grand Canyon and Las Vegas and its surrounding areas. We’ll work with you to create one-of-a-kind excursions that leave a lasting impression, transform the way you do business, increase engagement and create connections while boosting morale. Your group will love their thrilling eco-conscious trek—and they’ll thank you for months to come. We offer catering options that range from picnic lunches to chef-prepared meals. Contact our team to learn how we can tailor food and beverage services to your group.